If you have been a fashion blogger for over a year, getting invited to high profile events becomes a part of your blogger routine. However when the Fashion Features Director of Harper's Bazaar India personally invites you to an event, you know for a fact that it is something you do not want to miss. 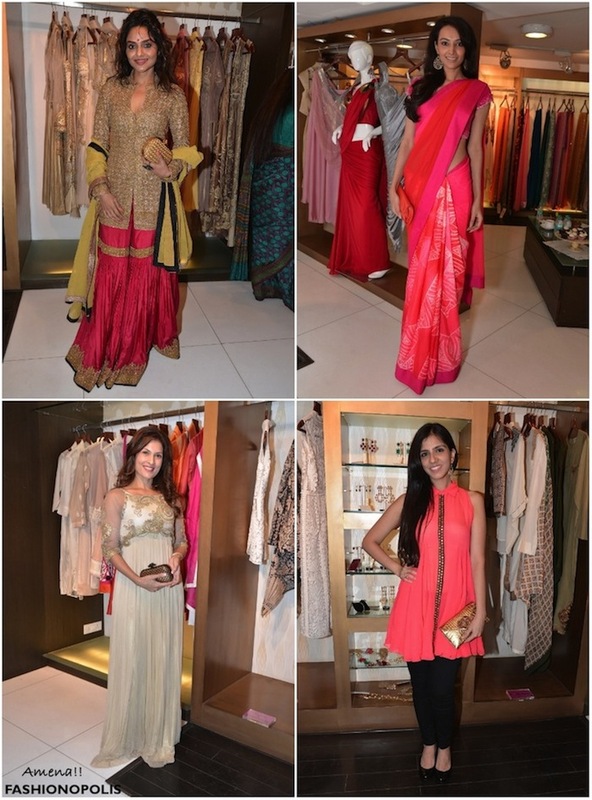 Samsaara in association with Harper’s Bazaar India hosted a private preview to showcase the new Spring/Summer arrivals at their luxurious boutique in Kemps Corner, Bombay. 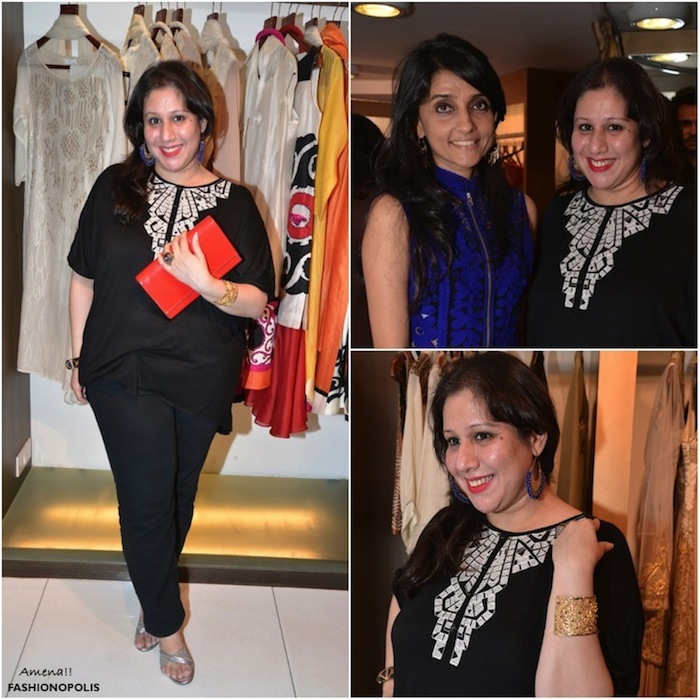 I was one of the only two blogger lucky enough to be invited and attend the event. Renowned designers Anand Kabra, Nachiket Barve, Geisha by Paras & Shalini, Nishka Lulla, dressed the muse of their choice in their latest creations. The ladies of the evening represented everything from festive finery to casual chic. Madhoo Shah looked like like a modern day ‘Maharani’ in a resplendent gold and maroon sharara from Anand Kabra, Dipanita Sharma dazzled in a Nachiket Barve creation. Nisha Javeri was adorned in an antique gold sweeping gown from Paras and Shalini’s label, Geisha. Nishka Lulla flaunted her boho chic side in her own design. Along with admiring the latest collection I had a chance to meet some of the city's most stylish ladies: Chhaya Momaya, Mandira Bedi, Zeba Hohli, Lata Patel, Ramona Narang, Deepika Gehani, Dilshad Khambatta, Bindu Mittal, Arti Murjani, Bindu Zaveri and Jasna Thakersey. While all the ladies were dressed in their finest best, my personal fave look was of none other than Ms. Ami Patel, Creative Director of Harper’s Bazaar India. Known for creating icon covers and fashion magazine editorial and dressing famous celebrities such as Priyanka Chopra, Ami stood out in a crowd of well dressed fashionistas and looked simply spectacular in a Pankaj And Nidhi creation. While I loved the clothes, it was Isharya's jewellery that called out to me. I could not help but try out Isharya Green Blue Moon Bali Filigree Hoops and Jaali Filigree Statement Cuff. Samsaara's entire Spring/Summer collection has something for everyone. The breezy ghagras by Anand Kabra were perfect picks for summer brides. Amit Aggarwal's fantastical creations and Gaurav Gupta's draped dresses were ideal for those looking to experiment with the creative side of fashion and invest in statement making pieces. If colour is your thing, Nachiket Barve's kitch sarees and Nishka Lulla's neon creations have your name written on it. It was one of those lovely summer afternoon where I not only had a chance to view the lastest and best of Indian fashion but I also has a chance to discuss fashion with Indian fashion industry stalwarts. All I can say is thank you to the team of Harper's Bazaar India and Samsaara for inviting me. It was one memorable soirée. Loved your tangerine clutch and smile! Very well-written post Amena and to reiterate I am super J that you got to meet Ami :) Great pics too!